Alexander started climbing when he was 6 years old. By age 10, he was already climbing 300-meter multi-pitch routes with his father. In 2006, Alexander began training with the local Bavarian team Landesstützpunkt Franken, and later trained with Bundesstützpunkt Sportklettern in Erlangen-Nürnberg, where he met Ludwig “Dicki” Korb and Patrick Matros—the coaches he still works with today. He made his competition debut in the 2006 Bavarian Sportclimbing Cup and three years later won the first of two European Youth Cup championships. 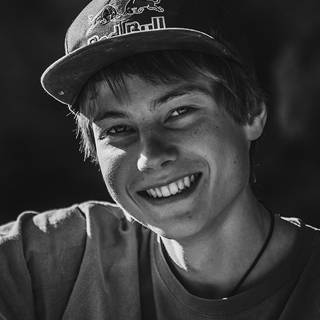 In 2007, at age 14, Alexander climbed his first 8a (French scale). He topped out on Drive By Shooting— his first 8c—in 2009 and in 2011 he scaled San Ku Kai, his first 9a. Alexander’s 2013 ascent of Spain’s Estado Critico is the world’s first published 9a onsight. Today, Alexander spends most of his time training and traveling to world-famous crags, where he often climbs the hardest routes or opens new routes.